Though many people seem unaware, the popular Heathrow to London Airbus service stopped running in late 2004 after 23 years of service. Airbus ran 3 routes, the A1, A2 and not surprisingly, the A3. The A1 terminated at Victoria but also made stops along the Cromwell Road which linked up with local hotels, bus and tube stops. The A2 stopped at Marble Arch and along Hyde Park and went onto to Kings Cross via the West End. The A3 was planned to link out to Stansted Airport. These buses were run by London United. When the Heathrow Express service owned by BAA started services in 1999 this hit the popularity of the Airbus routes with the decision to remove the A1 route being made. The A2 then switched to terminating at Russell Square instead of Kings Cross. 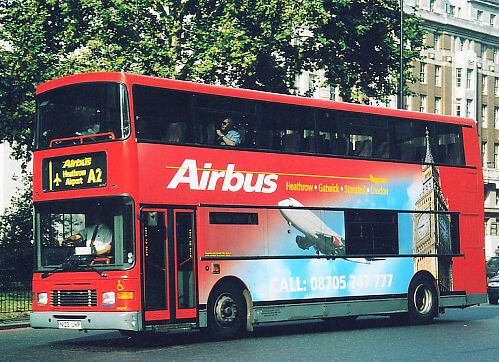 London United also sold the Airbus service to the National Express owned company called Airlinks at the time of this decline. Now all National Express buses from Heathrow terminate at Victoria Station. To get to Marble Arch now requires switching to another bus at Victoria. It seems the A2 route though still requested by many people is perhaps underestimated in terms of value to the company.